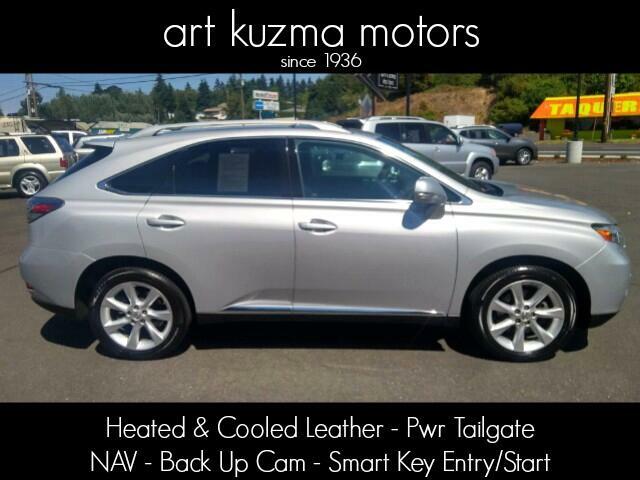 CERTIFIED 2010 Lexus RX350 AWD SUV! Low One-Owner Miles! Heated & Cooled Leather Seats! Moon Roof! Low One-Owner Miles on this Beautiful RX350 AWD SUV! Lexus Quality, Comfort, Quietness, Style, and Luxury! Fantastic Features include Dual Power/Heated/Cooled Seats with 3 Driver Memory, Back-Up Camera and Front and Rear Parking Sensors, Power Moon Roof, Voice Navigation, Power Tailgate, Rear Spoiler, 19" Alloy Wheels, Wood Trimmed Interior, Smart Key Technology with Push Button Start, Automatic Headlamps, Premium Sound Satellite Ready AM/FM/MP3 Multi-Disc CD with Aux./USB Inputs, Bluetooth, and even more! 5 Star Crash Test Ratings from the Front and Rear Side Air Bags, Front and Rear Head Curtain Air Bags, and "ABS" Brakes with Stability and Traction Control! This Lexus SUV is a Vehicle that You will Enjoy for Years to Come!